Every month of the year in Umbria offers enticements! On January 5th, the vigil of the Epiphany, the good witch, Befana, fills the children’s stockings …and she’ll be in the piazzas of many an Umbrian hilltown the next day to greet the bambini. On January 6th, Epiphany, many Umbrian mountain villages re-create the first Nativity with evocative “living” crib scenes. In January, farm families gather around the hearth to share stories: join us! In early January, “living manger scenes” animate Umbrian villages, particulary the mountaintop towns around Assisi and the “monumental” crib scene in Citta’ della Pieve is not to be missed. Take time, too, to see the crib scene in the grotto in Orvieto when you head there for the Umbria Jazz Winter Festival. January 17th, the Feast of St. Anthony, is a special day in Assisi and Perugia. Perugia is in festa on January 29th, celebrating San Costanzo, the city’s patron saint. Up at Catecuccio, (near Assisi), join our farm neighbors on Saturday nights for dancing and feasting. In Foligno, not far from Assisi, the city celebrates its patron saint, San Feliciano on January 24th and the day after, an open market fills the city. On January 27th, Trevi‘s evocative Processione dell’Illuminata, the oldest procession in Umbria (originating in the Middle Ages) brings light to the winter darkness. Join the local people for this most moving event. 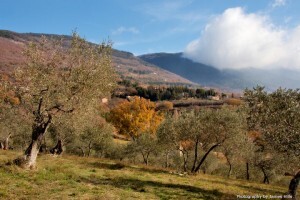 Few tourists visit the hilltowns in January: savor our Umbria with just “the locals”! February, too, is a quiet month in Umbria and uncrowded medieval backstreets attract the traveler. Come to Assisi for the month to study Italian at our superb language school! Savor the silence in the medieval churches, wander museums without the crowds. Head to Terni on February 14th for the celebrations of their patron saint, San Valentino. 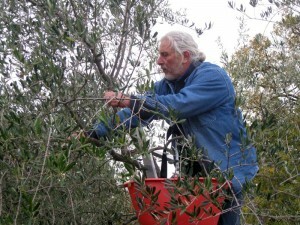 I return from my annual US cooking lessons/lectures tour in mid-March, when the pruning of olive trees starts in Umbria. 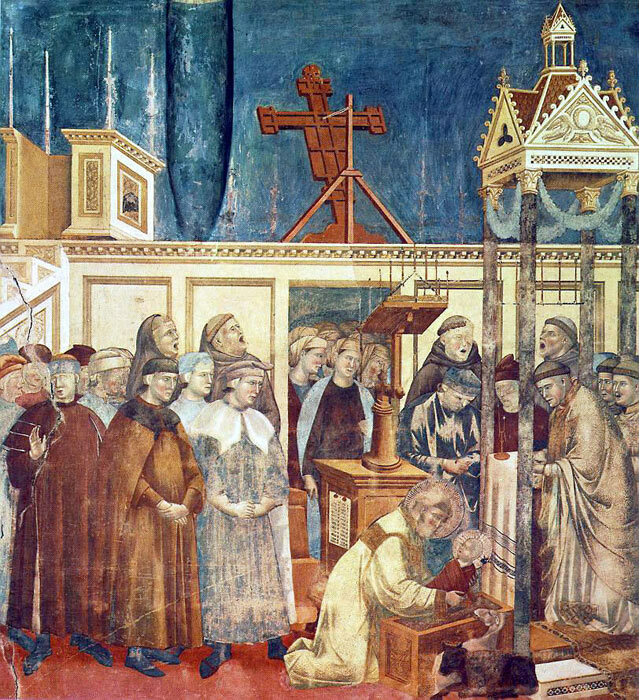 On March 20th and 21st, festivities in honor of St. Benedict, born in Norcia in the 6th c. A.D., take over his city. 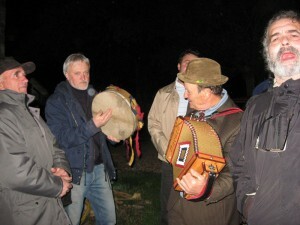 The first of the sagre will animate the Umbrian villages with the best in local cuisine and camaraderie. Meet our rural friends in their vineyards or olive groves or join them for dinner and ballroom dancing on Saturday nights at Catecuccio, near Assisi. Driving through the countryside, you’ll notice the emerald greens of the sprouting wheat, oats and barley backdropped by the silver greens of the olive trees. Ah, Umbria, “Italy’s green heart”. Most tourists will arrive later in the spring: why not come sooner? Easter (generally – though not always!) in April is a most special time here in Umbria. Do not miss Good Friday in Assisi and Holy Saturday in the Assisi rural area. 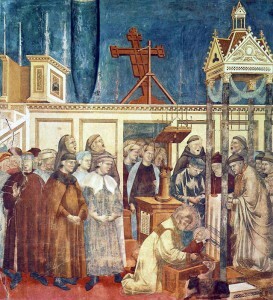 In Citta’ della Pieve, on Easter Sunday and Easter Monday, le Quadre Viventi (“living images”) bring to life the episodes of Christ’s Passion and death. 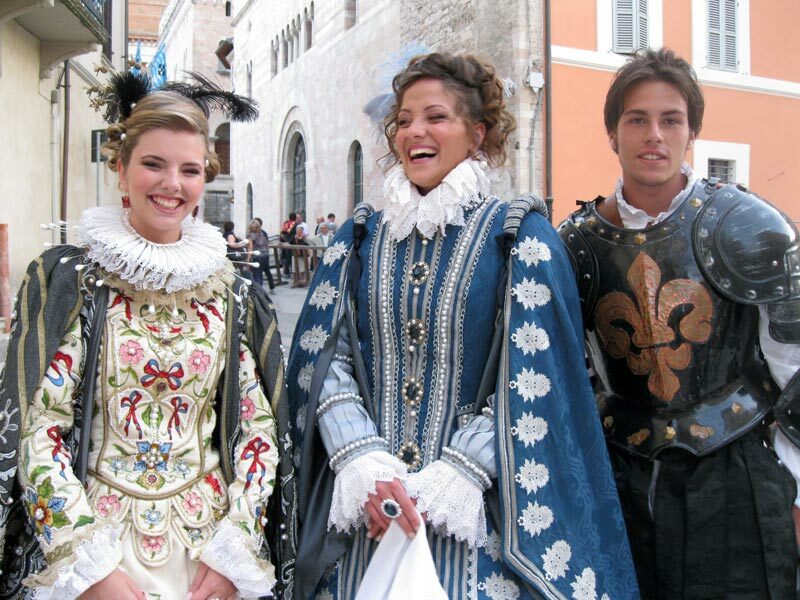 Join the “locals” in Gubbio on April 25th for la Festa della Liberazione. At April sagra events, villagers invite us to enjoy the best in home-cooking and join in ballroom dancing. Join in! Enjoy a dinner in our Assisi area farmhouse on April 30th, when the maggiaioli (“May singers”) sing in the arrival of May with traditional songs. 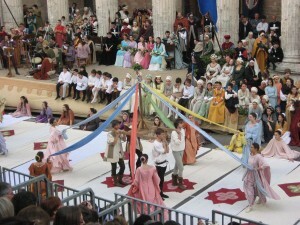 Near Gubbio, a curious festival in San Pellegrino on April 30 celebrates the arrival of May. On April 30th, join the Assisians as they celebrate Madonna Primavera (“Lady Spring”). At the end of April, wild asparagus start sprouting in our woods, adding a special addition to cooking classes in our farmhouse. May is the month ofwondrous festivals all over Umbria. In early May, the stupendous 3-day medieval festival, Calendimaggio, takes over Assisi and in Gubbio, the famous CERI are carried down from the mountain in preparation for the exciting Corsa dei Ceri on May 15th. 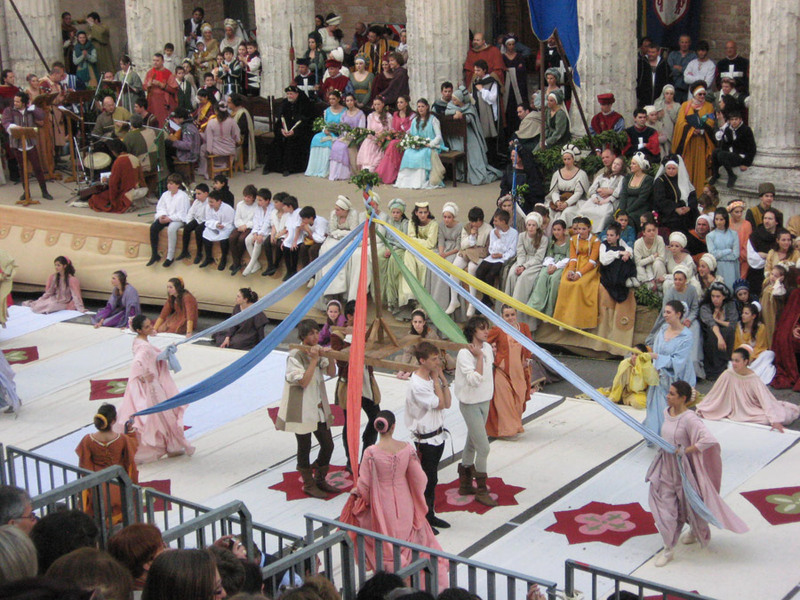 The Palio della Balestra (“Crossbow Contest”) winds up May in Gubbio. 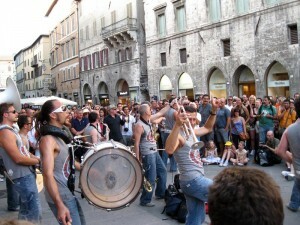 May sagra events liven up small villages all over Umbria. During La Corsa dell’Anello in mid-May, the Narnesi once again live their medieval history – and with what passione! Cascia celebrates St. Rita, patron saint, on May 22nd. 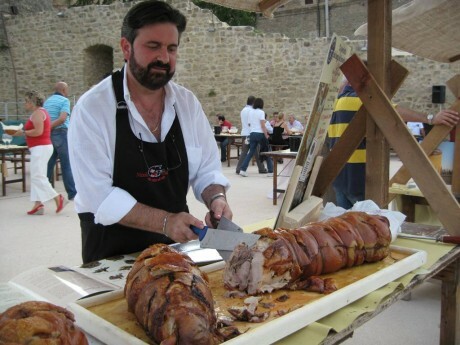 Not far from Todi, San Terenziano celebrates la porchetta in May – join in! 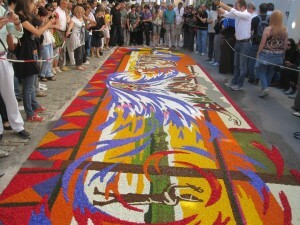 (Note: the Infiorate festival in Spello is a “moveable feast” and generally falls in June – but occasionally, in May). Roam the outdoor markets of Umbria and you’ll note bunches of wild asparagus. Savor the goodness at Eggi’s Sagra degli Asparagi in early May (late April). If you stay in our countryside apartments, join me one morning for wild asparagus-hunting! On June 2nd, the Gubbio Ceri Piccoli festival celebrates the youngest Ceraioli who run the same mad race up the mountain which the men run during the Corsa dei Ceri (in May). In Gubbio on June 22nd, the town remembers the town’s forty modern-day martyrs. June 24th is a most special moment in the Umbrian rural year. Grello, tiny mountain town near Assisi, lives a sacred rural rite with a fascinating nighttime festival. I never miss another splendid Umbrian festival, the Infiorate in Spello …and Assisians create floral wonders, too. Bevagna lives the Middle Ages at the end of June with the Mercato delle Gaite festival and Foligno celebrates the Baroque period and Baroque splendor with la Quintana. The Spoleto Festival draws in lovers of music and theater from all over Italy and all over the world at the end of June/early July. Even the small towns celebrate June with seasonal events: join the locals in the village of Castelnuovo near the end of the month for their lavender festival, la Festa della Lavanda (click here to see photos of the wonders). Head to picturesque Vallo di Nera mid-June for their festival of every imaginable type of cheese. You won’t want to miss the stunning flowerings in Castelluccio, end of June. In mid-July, glorious medieval Perugia erupts with the explosive energy of Umbria Jazz (Umbria Jazz heads to Orvieto for Umbria Jazz Winter). Sagras all over Umbria July invite you to share in rural banquets and ballroom dancing with “the locals”! On the last Sunday of July, at Passignano sul Trasimeno, lakeside village, the Palio delle Barche festival brings to life, once again, the 15th-century rivalries among noble Perugia families. In mid-July, at Poggio di Otricoli, the villagers re-enact medieval life for the three days of the Giornate Medioevali festival and Amelia celebrates the Palio dei Colombi with medieval jousting matches, crossbow contests and medieval banquets at the end of July and in early August. Gubbio hosts various theatrical, musical and cultural events in its 1st-c. AD Roman theater in late July and in August. The Lake Trasimeno towns – and islands – attract blues-lovers during the July Trasimeno Blues events. At the end of July and in early August, in Castel Rigone, the Festival dei Giovani Concertisti transforms this charming medieval borgo into a concert stage for young performers of classical music. No better month for a sagra than August! Villagers all over Umbria gather to share good food, ballroom dancing on summer nights. In early-August during their 10-day Corciano Festival, the locals transforms this charming medieval borgo near Perugia into a showplace of medieval life with an astounding array of events. For a week in mid-August, the charming medieval village of Montone brings to life la Donazione della Sacra Spina (“The Giving of the Sacred Thorn” – ie, one from Christ’s crown), a late 15th-century moment of the village’s past. 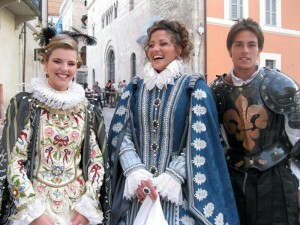 All the townspeople live their Renaissance history during that week with a rich program of events. In mid-August, crossbows take over Gubbio with the Torneo dei Quartieri and in nearby Valfabbrica, at the end of August, medieval jousting events start, lasting into early September. Amelia celebrates the Palio dei Colombi with medieval jousting matches, crossbow contests and medieval banquets at the end of July and in early August. Near the end of August, Assisi celebrates its patron saint, San Rufino, with il Palio di San Rufino, a crossbow contest (and a medieval market, banquets add to the festivities). 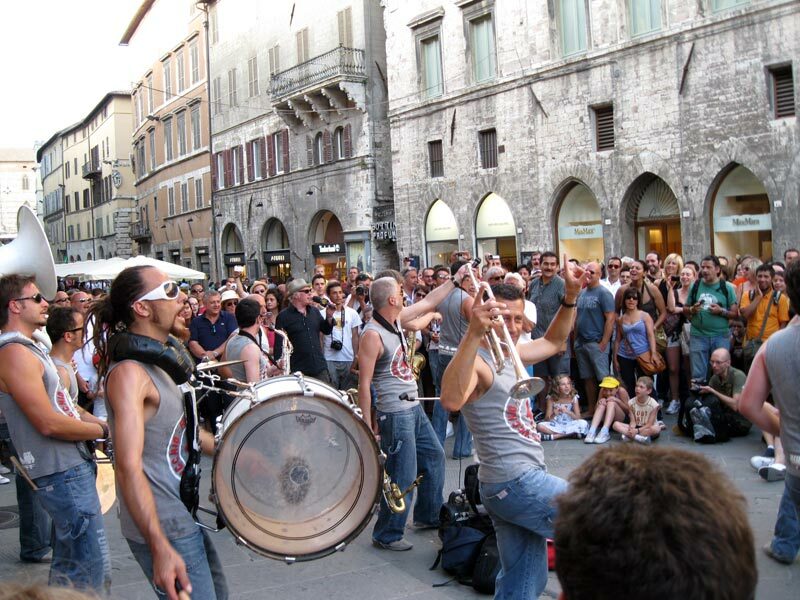 Gubbio hosts various theatrical, musical and cultural events in its 1st-c. AD Roman theater in late July and in August. In early August, in Castel Rigone, the Festival dei Giovani Concertisti transforms this charming medieval borgo into a concert stage for young performers of classical music. September is a wonderful “festa” month in Umbria: you won’t want to miss the Baroque festival la Quintana in Foligno and the extraodinary food festival, I Primi Piatti, there at the end of the month. Classical music fills the churches and medieval buildings of Umbria in September during la Sagra Musicale Umbra. Deruta‘s Corsa delle Brocche brings to life its Renaissance past. In early September, Montefalco celebrates their prized wine, Sagrantino, during la Settimana Enologica (“wine week”) near the end of the month. During the years we farmed, September brought the grape harvest and mushrooming-hunting. In Citta’ di Castello, the international horse show, Mostra del Cavallo attracts visitors from all over the world. In mid-September in Spoleto, the food festival Spoleto Tipica highlights the typical foods of the area: truffles, olive oils, lamb, cheeses, honeys, prosciutto, legumes…and more Trasimeno Blues events entice blues-lovers to the Lake Trasimeno hilltowns. The Giochi delle Porte festival in Gualdo Tadino, near Assisi, animates the town with medieval festivities in authentic costume at the end of September. Bastia Umbra, near Assisi, celebrates the patron saint, San Michele Arcanagelo, with contests and food events for the last week in September. Sagra events all over Umbria draw in the “locals” for local food specialties and ballroom dancing. On a sober note, September 26th is a sad anniversary in Assisi: in 1997 a devastating earthquake hit the area. Umbria’s post-earthquake restoration is an extraordinary technical and artistic achievement. November starts out with “sweets, saints and cemeteries”. Do not miss a visit to the Assisi cemetery in early in the month. November is olive-picking time and olive oil mills all over Umbria open their doors to visitors, for tastes of the newly-pressed oils on bruschetta and all sorts of cultural events. We’ll be harvesting our olives mid-month, most probably (join us!) and the UNTO Olive Oil Festival animates Assisi’s main square in early November. Torgiano hosts the Vaselle d’autore in mid-November featuring ceramic masterpieces from all over the world and Amelia celebrates its patron saint, Santa Fermina, with mid-November celebratory events. Trevi is alive with all sorts of events tied to their famous olive oils for much of the month. The White Truffle festival of Citta’ di Castello is not to be missed. On November 11th all over Umbria, the new wines are savored, often paired with roasted chestnuts. Chestnuts, olive oils, and truffles reign in events all over Umbria in November – and in December. 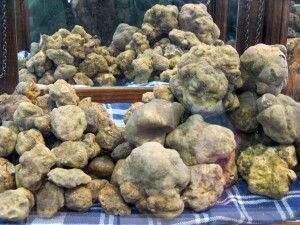 In late November, taste truffles and other Umbrian delicacies in nearby Valtopina at the Mostra Mercato del Tartufo. As the weather gets colder, farm families gather near the hearth fires after dinner, sharing stories of past times. Do not miss Assisi’s unique Christmas celebrations. Tiny mountain villages around Assisi attract visitors with “living manger” scenes and do not miss Gubbio in December: you’ve never seen such a Christmas tree! And while you’re there, do see the life-sized Nativity scene in the San Martino district. From December 8th, the “From Bonfire to Pasquarelle” festival animates Cascia and the town hosts exhibits of artisan crèche scenes. Perugia hosts an Christmas arts and crafts fair in the 16th-century Papal fortress for most of the month, where hundreds of artisans show and sell their creations. Near the end of the month, the Umbria Jazz Winter festival fills magical Orvieto with the best in jazz music, right up to the New Year.